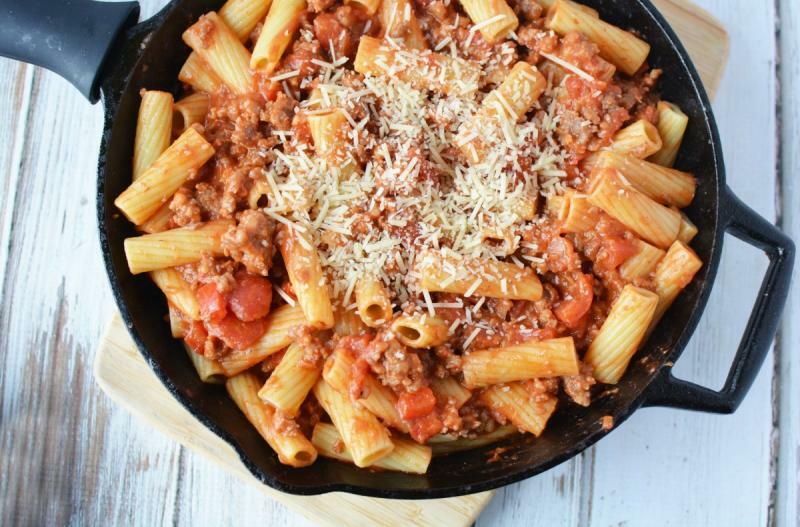 This sauce is perfectly balanced with just the right amount of tomato, sausage and cream. And it’s lovely with a thick pasta like rigatoni, with a splash of Parmesan cheese over the top. Enjoy! In a large skillet, brown the ground Italian sausage (casing removed) with the chopped red bell pepper, minced onion and garlic powder. Once browned, drain and then mix in the diced tomatoes and tomato paste until thick meaty-tomato sauce forms, then stir in the heavy cream. Let simmer for a few minutes to allow flavors to mingle. 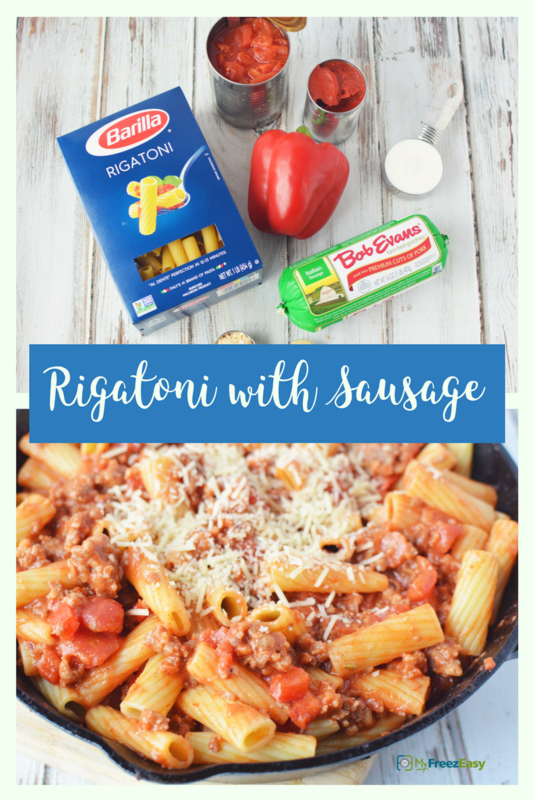 Serve Rigatoni with Sausage with side salad. Brown 2 lbs. ground Italian sausage (casing removed) with 2 Tbsp minced onion and 2 tsp garlic powder. Chop 2 red bell peppers. Open 2 cans of diced tomatoes and 2 cans of tomato paste. Put bag in the freezer and freeze up to 6 months in fridge freezer or 12 months in a deep freezer. Thaw in the fridge overnight, or a warm shallow dish of water for about 20 minutes, before transferring to the skillet to reheat the meat sauce. Swirl in cream once the sauce is bubbling, and then toss with cooked pasta. Thaw and transfer to skillet to reheat, then swirl in the cream once the sauce is bubbling. Toss with cooked pasta and garnish with grated Parmesan cheese.